Running shoes, shoes, shoes and more shoes what can I say? I have literally seen them all and, even more, have tried them all. My bank account can surely testify to the fact that I don’t have a shoe fetish, but, rather a desire to find something that will make my feet, hips and knees happy. I have tried trendy triathlon shoes, casual walkers, racing flats and cutting edge shoes that promise new personal records and even lower heart rates. Claim after claim. What am I to do? Well, my feet and I set out on a journey to find the best shoes that will allow me to race and train with little or no pain. I knew it was a long shot, but after many hours and research, trial and error, I have been able to say with confidence that my feet and I now have a mutual understanding. My friends, I am eager to report to you that the search has been declared over. Why do you ask? Have I given up on running? Have my feet fallen off? Or did I, wait for it, find a shoe that actually makes me run and train with less pain and inflammation? May I introduce you to my new love and best friend Hoka One One. Hoka One One has delivered to me a present that has long been hiding under my proverbial Christmas tree. I contacted Hoka in hopes that they would allow me the privilege of trying their shoes to try to make a breakthrough in my search. Hoka’s Jay and Cyrus where so gracious to send me a pair of Bondi B’s to try and I eagerly accepted. My initial reaction was that these shoes do not look like the typical running shoe. They have an over sized and wider look to them. But this serves a well-designed purpose. The Hoka One One Bondi B and Mafate style provide exceptional cushioning and support that I have never felt before. This is crucial for clubfooters because each stride brings a pounding on the joints and ligaments like no other. I have put in several miles thus far while wearing the Hoka’s and I am glad to report a significant reduction in pain and swelling after each training session. Dare I say, I am looking forward to my next run, especially my next race in 4 weeks? I am amazed at the quality and design behind the shoe; pure genius in my opinion. Hokas provide an exceptionally cushioned ride. 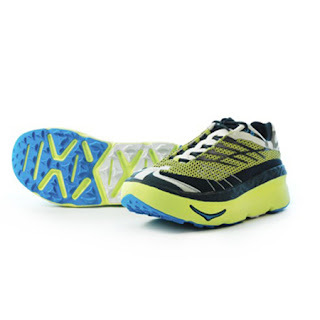 In addition to their Trail running shoes, Hoka now offers a road running shoe of similar design and cushioning system. As I am writing this, I am wearing their causal black leather shoe that serves well in the work place. I am no shoe expert, but I can tell you how I feel. I don’t know all the correct terms and lingo, but I can tell you I feel great. I guess, in a sense I have become a bit of an expert in my shoe journey and I have tried numerous shoes and none compare to the Hoka One One. I am pleased to be working with them this year and want to thank them for their sponsorship. I will definitely be racing Ironman Arizona in my Hoka’s. I highly recommend looking into getting a pair for clubfoot pain. These shoes provide the cushioning that we all need and the stability we all desire. I won’t leave home without em! I would love to come across a stockist in South Africa. Please let me know if they have one. I tweeted and wrote to them today also. I am close to tears right now. All I want to do is go run. I have "good" running shoes, but my feet still hurt.